We’re all busy people and we lead busy lives, and sometimes after a long day at work, you just want something simple and classic to help you unwind. In the world of iPhone gaming, low-stress and familiar can be just as important as fancy and innovative, and that’s where Word Quest comes in. One thing to be wary of, and I’m not entirely sure how this even happened, but there are two different Word Quest games. Both are word searches and the same price, but this review is for the one from Apostek Software. 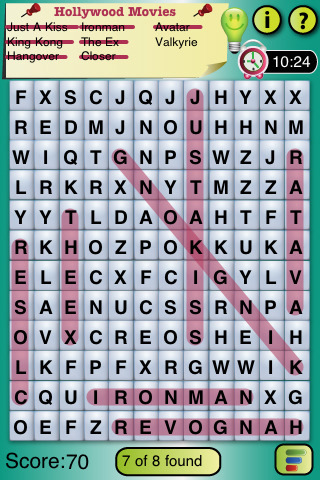 Word Quest is a basic, no-frills word search, just like the ones you did as a kid. You have a bank of words and a 12 x 12 grid of letters to search in. Words can be up, down, or diagonal, and they can be backwards or forwards. There are two difficulty settings; Easy gives you 8 words to search for and hints, while Hard gives you 10 words and no hints, but double the points of Easy. Games are timed, but there is no limit, although you do receive bonus points if you finish a game within the first one or two minutes, and you’re competing for high scores amongst iPhone, iPod Touch, and Android users. It’s about as stripped down as you can get, and there really isn’t anything to do but search for words, but one of the nicer features is the ability to choose your category of words, like food or cartoons. There are several categories to choose from, and you can even get extra brainy and search from a GRE-GMAT list. They also have some separate UK and US specific lists, for things like TV shows, which is a nice touch. The graphics are basic to the point of bland, but they do get the job done, although the interface is a little awkward. While the touch controls are smooth, intuitive and easy to use, it’s difficult to see the grid as you’re trying to select a word. The developers seem to have tried to address this problem by giving you a pop-up bubble that highlights the letter you’re currently over, but it’s not very large and still easily obscured by your finger as you swipe. There is also next to no sound, which is a little unfortunate, and I would really love to see a version of this where you can listen to your own music as you play, since the game is sorely lacking in any personality of its own. Word Quest certainly won’t win any awards for best-looking or most dynamic word game out there, but it does a very good job at delivering the basics of a classic game. It’s not going to dazzle anyone with neat features or interesting tricks, but it is reasonably educational, kid-friendly, and infinitely replayable, so, all in all, not a bad deal for $0.99. AppSafari review of Word Quest was written by Tracy Yonemoto on May 30th, 2010 and categorized under App Store, Games, iPad apps, Puzzler, Word Games. Page viewed 4862 times, 1 so far today. Need help on using these apps? Please read the Help Page. Thanks a lot for the review, Tracy. We have a whole new set of updates coming up soon and we will incorporate some of things you’ve mentioned.